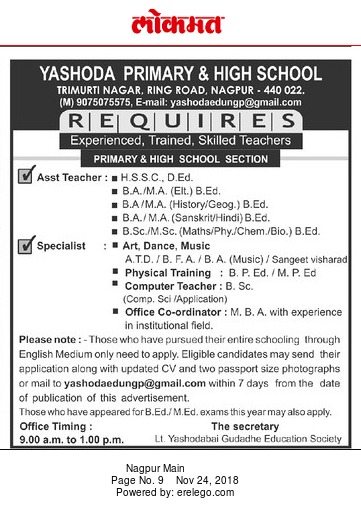 Yashoda Primary and High School, Nagpur has advertised for the recruitment of Assistant Teachers / Specialist jobs vacancies. Interested and eligible job aspirants are requested to apply within 07 days from 24th November 2018. Check out further more details below. About School: Yashoda public school satara in NH4, Wadhe Phata, Satara 415011is co-educational senior secondary institution affiliated to the central board of secondary educational (CBSE) on provisional basis since 2014. The school is equipped with 15 class rooms and all essential facilities . If you are looking for details in admission / application forms , fees , school timings , vacations/ holidays schedule or facilities provided , kindly visit the relevant department of the school. How to Apply: Interested and eligible candidates are requested to send application along with their CV, copies of certificates and 02 PP size photos to the following email address. Those have done entire schooling through English medium only need to apply.